Asked to conjure up an image of a quintessential Cotswold scene, most people will come up with some combination of a village of honey-coloured houses set against a backdrop of sheep grazing in hillside fields, demarcated by seemingly endless dry-stone walls. For once, the reality and the picture-postcard image still coincide, at least in part. Nevertheless, to walk the Cotswold Way is to discover a far more complex – and arguably more rewarding – environment, where wide tracts of arable land unfold over the hills, and ancient beech woods line the Cotswold escarpment. With the Cotswold villages of tourist brochures along the early part of the route, and the architectural glories of Georgian Bath that await the walker in the south, it’s soon clear that Cotswold limestone has been hugely influential in defining the landscape. As you head south, so the stone of the houses gradually fades, from Stanton’s golden cottages to the palest ivory of Painswick’s villas. Simple parish churches, towering follies and stately homes make their mark, too, all constructed of the same stone. Yet it’s not just the stone that hints at the region’s history. You won’t get far without coming across any number of humps, lumps and bumps, relics of earlier inhabitants who left their mark in burial mounds, hill forts, monasteries and even villas right across the trail. Their chosen spots were often some of those most revered by today’s walkers: wide-open expanses on windy hilltops with views west to the wide River Severn and the Malvern Hills. Almost the entire trail runs through the Cotswolds Area of Outstanding Natural Beauty, crossing fields still bounded by hedges and walls, and hills where sheep have grazed for centuries. In the early years, merchants grew rich on the bounty that was sheep’s wool, their fortunes invested in the foundation of towns from Chipping Campden to Dursley. Where grazing has ended, human intervention has ensured that at least some of the rich grassland can remain a haven for the wild flowers, birds and insects that previous generations took for granted. 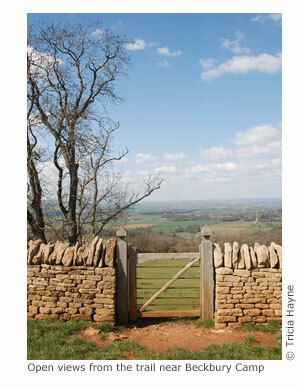 Thoughtfully, the Cotswold Way crosses all these places – and perhaps that’s the greatest advantage of a man-made trail. While earlier walkers must have taken a direct route on pilgrimage to the abbey at Hailes, today’s hikers on the Cotswold Way find themselves twisting and turning along a trail that effectively showcases the very best that the region can offer. That that includes historic castles, more than a passing nod to the Arts and Crafts Movement, and some excellent pubs, is to the benefit of all.